If you were injured in a car accident and you are receiving medical treatment at Holy Cross Hospital, our Fort Lauderdale car accident lawyers are available to assist you. If you slipped and fell and were hurt and you ended up in the Holy Cross Emergency Room, our Fort Lauderdale slip and fall lawyers can help you. If you were seriously injured while at Holy Cross Hospital, our Fort Lauderdale personal injury lawyers are available to represent you and your family. Just call us toll free at (855) 982-2067 or at (305) 285-1115. All personal injury consultations are free and we never charge a fee unless we make a recovery for you. In 1955, Holy Cross Hospital was founded. 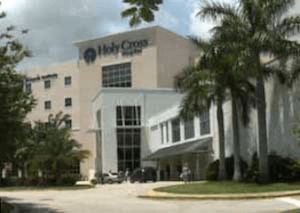 It is non-profit Catholic hospital located near the intersection of Commercial Boulevard and Federal Highway in Fort Lauderdale. It has more than 555 beds. Holy Cross is a member of Trinity Health and serves the injured and sick of the community without regard to nationality, race, religion or sexual preference. If you are in the Holy Cross Emergency Room following any type of accident and need to speak with a Fort Lauderdale personal injury lawyer, you can reach our Holy Cross accident attorneys 24/7 at our toll-free number (855) 982-2067 or at (305) 285-1115. We are standing by to answer your questions and assist you in any way possible. You can also see us by appointment at our Fort Lauderdale offices located minutes from Holy Cross Hospital at 101 NE 3d Avenue, #1500, Fort Lauderdale FL 33301. At the Wolfson Law Firm, our Fort Lauderdale personal injury lawyers offer you full and complete legal representation in any form of personal injury or wrongful death claim or lawsuit. We will provide you and your family with a professional and relentless representation so that you will ultimately receive the justice and compensation that you deserve. Don’t be a silent victim if you were hurt due to the negligence or intentional actions of another. Call today for your free consultation at toll-free number (855) 982-2067 or at (305) 285-1115 and take the first step to protect you and your loved ones.